The Sligo Family Resource Centre is one of 120 Family Resource Centres under the Family Support Services Programme based throughout the country. 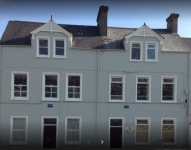 Sligo FRC, as we are commonly known, operates at the heart of the Sligo Community and works with individuals, communities and organisations to try and bring about positive change in the quality of life for all people living in and around Sligo town. We encourage all community members to drop in and see what we have to offer. Footprints crèche open every day from 09:30 to 16:00 – bookings can be made at short notice. Family support directly in the home is available to families who need some support at a challenging time in their lives. This is provided by trained Family Support Workers to families in Sligo Town North Sligo and North Leitrim. Families can refer themselves and we take referrals from GPs, PHNs, schools and other professionals. Parent Zone – every Thursday morning – trained Family Support Available for one to one support for parents on anything parenting/children related – can drop in or make an appointment with Karen. Danu Birth Mothers are a group for mothers who have placed their child for adotpionwho meet 4-5 times a year to talk about their experiences of adoption. It is an opportunity to meet others who have been in a similar situation, gives confidence to speak about their experiences and to gain an understanding about the grieving process associated with placing a child for adoption. Parenting Support Champions This initiative is part of a wider programme in Túsla to develop prevention partnership and family support. Parenting Support Champions role is to promote parenting family well being and the Túsla Parenting Support Strategy within their area by finding local opportunities to develop approaches to supporting parenting to disseminate the 50 Key Messages and to link with Children and Young Peoples Services Committees (CYPSC) and Children and Family Support Network areas. (CFSN). Adoptive Parents Support Group Parents who have adopted children set up this group in 2005. In the early years the group met on the last Monday of every month, organised and attended relevant workshops, liaised with other adoptive parents support groups throughout the country, organised a summer event and Christmas party for families. Nowadays the group meets independently of the FRC but links in when necessary as in when we have an inquiry from an adoptive parent, to share information etc. Every Tuesday there is parent and toddler group held, from 10:30 to 11:30. It involves music, games, drama and everything fun for parents and children. Our Parents Plus Early Years Programme starts Wednesday 16th January.. This 8 week parenting course is very popular, it is practical and positive in promoting confidence, learning and good behaviour in young children aged 1 to 6 years. For children third – sixth class available one evening /week with qualified primary school teachers. Sligo FRC has food hampers for those in need. This initiative is funded by European Union and the Department of Social Protection Sligo. All families who need a food hamper can come and get it in the Sligo FRC. All done in confidence. Starting with 18th January 2019, there are Crafty Friday Mornings every second Friday in Sligo Family Resource Centre. People with various cultural and ethnical backgrounds, those coming from other countries together with people from Ireland will come together to enjoy their time together from 10:30 to 12:00, while making crafts and sharing their stories over a cup of tea and coffee. This way we support integration, friendship and we help build strong community. We have more and more groups meeting in Sligo Family resource Centre, celebrating their culture, using our premises to socialise, sing, dance, support parenting. Here are just some of the countries represented by this activity in January 2019: Poland, Latvia, Egypt, Libya, Pakistan. In order to do this work we receive funding from Túsla Child and Family Agency National Office, Túsla Child and Family Agency Prevention Partnership and Family Support (PPFS) local office, Health Service Executive – disability services, Pobal, Department of Justice, Healthy Ireland, Sligo County Council Grants as well as support from the Department of Social Protection through the Community Employment Programme. To become a monthly featured member please complete this template and email to ppn@sligococo.ie. Members will be selected on a first come first served basis, provided all the correct information is given, until we have filled a full 12 month cycle.